The 1TB WD BlACK SN750 NVMe SSD delivers outstanding high-quality performance for gaming and hardware enthusiasts who are looking to build or upgrade their PC. 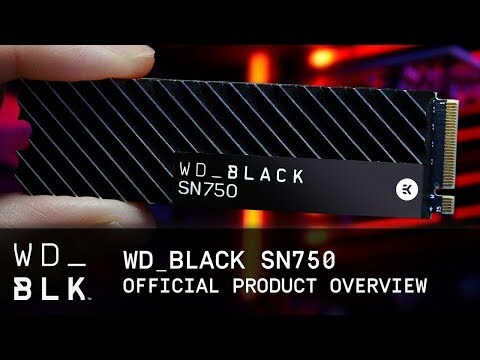 The WD BLACK SN750 drive slices your wait time to get back into action and gets you ahead of the game. At the core of the WD BLACK SN750 drive is its innovative NAND technology, pushing the limitations of storage by amplifying the storage density from its prior generation. The exclusive dashboard support enables you to access gaming mode to improve performance. At the core of the WD BLACK SN750 drive is its innovative NAND technology. By expanding the storage density from its former generation, the 64-layer 3D NAND goes beyond the boundaries of storage and showcases the astonishing feat of NAND revolution. The extended capacity up to 2TB on a single-sided drive although it may be compact in size, is still sufficient to store your large files and video games. * The WD BLACK SN750 NVMe SSD is available in capacities ranging from 250GB – 2TB. Whether you’re looking to enhance your system’s overall receptiveness or load games and levels rapidly, the WD BLACK SN750 drive gets you ahead of the game. WD’s fastest computing NVMe SSD can provide speeds more than six times faster than their fastest SATA SSD (up to 3,400MB/s vs. 545MB/s) to give dedicated gamers the competitive superiority they need. The WD BLACK SSD Dashboard offers you the power to optimize performance by enabling the gaming mode feature. This disables the low power mode function on the SSD, which keeps your drive at its maximum during extreme gaming sessions. WD BLACK SN750 SSDs are available in a M.2 2280 version to evolve with newer and smaller computers. With form factors to accommodate most laptop and desktop PCs, a WD BLACK SN750 SSD is ready for the job. WD BLACK SN750 solid state drives are among the lowest in power consumption in the industry. And with less power used, you can run your laptop PC for longer periods of time. Every WD BLACK SN750 SSD comes with a 5-year limited warranty, so you can be confident of your storage when you upgrade or replace any of your drives. With the downloadable WD BLACK SSD Dashboard, you get tools to help track things like available capacity, drive health, temperature, SMART attributes and more.